On a bitterly cold day, a famous legend goes, Martin met a poor man, almost naked, trembling in the cold and begging from passersby at the city gate. Martin had nothing but his weapons and his clothes. He drew his sword, cut his cloak into two pieces, gave one to the beggar and wrapped himself in the other half. Some of the bystanders laughed at his now odd apearance; others were ashamed at not having relieved the man's misery. That night in his sleep Martin saw Christ dressed in the half of the garment he had given away, and heard him say, "Martin, still a catechumen, has covered me with his garment." Born of pagan parents in what is now Hungary and raised in Italy, this son of a veteran was forced to serve in the army against his will at the age of 15. 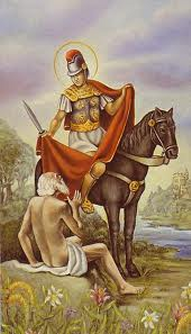 He became a Christian catechumen and was baptized at 18. It was said that he lived more like a monk than a soldier. At 23, he refused a war bonus and told his commander: "I have served you as a soldier; now let me serve Christ. Give the bounty to those who are going to fight. But I am a soldier of Christ and it is not lawful for me to fight." After great difficulties, he was discharged and went to be a disciple of Hilary of Poitiers (January 13). As death approached, his followers begged him not to leave them. He prayed, "Lord, if your people still need me, I do not refuse the work. Your will be done." from Saint of the Day, Lives, Lessons and Feast, By Leonard Foley, O.F.M. ; revised by Pat McCloskey, O.F.M.